OSAKA - While Nippon Ishin no Kai (Japan Restoration Party) battles for seats in Sunday’s Upper House election, it has given up on two key local races where the expected winners oppose its fundamental goals, further eroding support in its Kansai base. 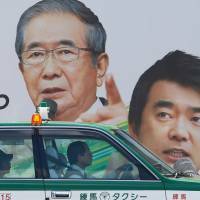 The Hyogo gubernatorial race pits Toshizo Ido, 68, the current governor and longtime Nippon Ishin critic, against Kotaro Tanaka, 64, in a race Ido is expected to win easily. Ido has the support of the Liberal Democratic Party, New Komeito and the Democratic Party of Japan. Tanaka is backed by the Japanese Communist Party. 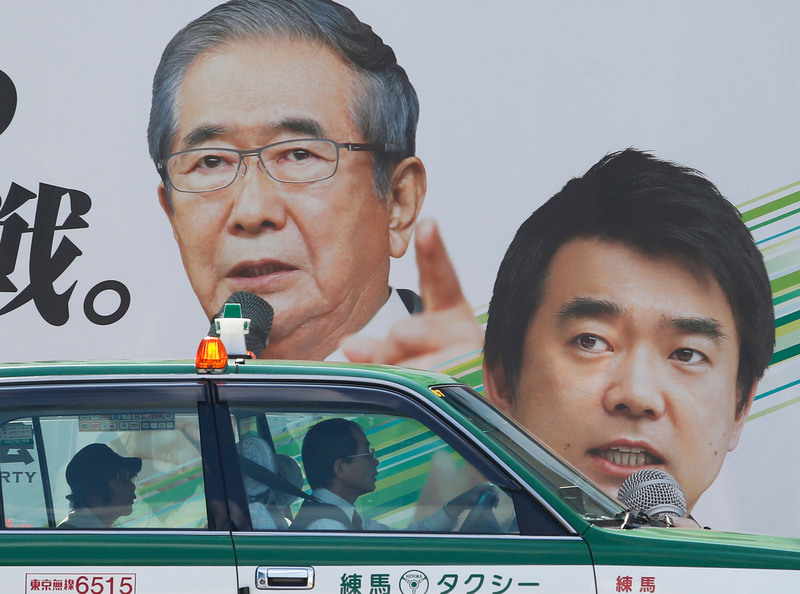 Until last month, it appeared Ido might also face a Nippon Ishin-backed candidate. Over the past few years, Ido, who also heads the seven-prefecture, four-city Union of Kansai Governments formed to promote regional cooperation, has been an outspoken critic of Nippon Ishin co-leader and Osaka Mayor Toru Hashimoto. The two have long clashed over Hashimoto’s proposal to close Osaka’s Itami airport, which straddles both Hyogo and Osaka prefectures. 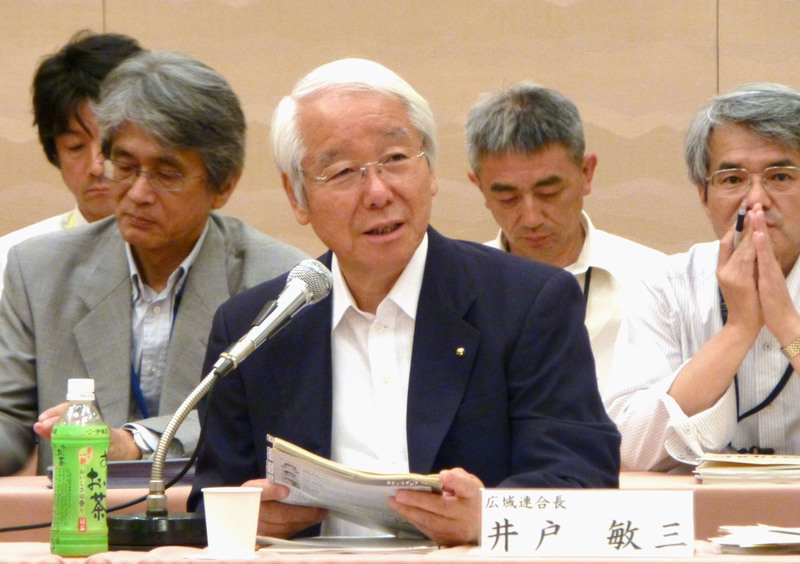 Ido has also expressed opposition to a core Nippon Ishin goal — elimination of the current system of 47 prefectures and replacing them with between nine and 13 semi-autonomous regional entities. After months of speculation, Osaka Gov. 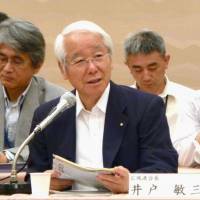 and Nippon Ishin Secretary-General Ichiro Matsui said June 19 that the party wouldn’t field a candidate in the Hyogo gubernatorial campaign. “There were thoughts (among party members) of wanting to do battle. But it’s impossible,” Matsui said. Nippon Ishin officials said the decision to pass on the Hyogo election was because they wanted to concentrate on the Upper House campaign of Takayuki Shimizu, 39, a former TV Asahi announcer who is running for the Hyogo district seat with the party’s support. But that hasn’t stopped senior officials from taking swipes at Ido over his stance on the regional government system. On June 22, Matsui criticized Gov. Ido during a visit to Kobe attended by about 250 supporters. “If the regional system is realized, the number of governors will decrease. Ido’s opposition to the system is because he’s not ready to give up his position,” Matsui said. Ido has also reacted cautiously to recent calls by Hashimoto and Matsui to bring the U.S. Marine Corps MV-22 Osprey tilt-rotor aircraft to Osaka’s city of Yao for training exercises, especially if their flight paths take them over Hyogo. “Even though the U.S. and Japan have an agreement not to fly aircraft, including the Ospreys, below 150 meters during training, it’s not being honored, and lots of irregular flights are taking place. Even though there have been complaints (from local governments) about this, there hasn’t been a proper response by the central government,” Ido said. Ido is seeking a fourth term as governor. His experience and personal popularity meant Nippon Ishin knew he’d be tough to beat well before Hashimoto’s May remarks about Japan’s wartime “comfort women” system being necessary at the time, which sparked a domestic and international furor and led to a drop in the party’s popularity. In addition, Hyogo voters have long been wary of Hashimoto and Matsui and what they see as an Osaka-based movement that, if successful, would empower Osaka at the expense of neighboring Hyogo. In April, candidates backed by Nippon Ishin lost mayoral elections in the two Hyogo cities of Takarazuka and Itami. If the situation for the party is bad in Hyogo, it’s worse in Nara. On July 2, Matsui told reporters Nippon Ishin was dropping its support for Nara mayoral candidate Kiyohito Asakawa, 58, who is also supported by Your Party. That decision came after Your Party ended its election cooperation agreement with Nippon Ishin following Hashimoto’s comfort women remarks. That same day, Hiromi Yoshida, 51, president of the Nara International Exchange Center, said he would not run for the Upper House. Nippon Ishin had planned to field Yoshida as the Nara district candidate. Yoshida was the sixth person to say no to a Nippon Ishin candidacy for the Nara district. His decision came a couple of weeks after Nobuaki Yamamoto, 58, who founded Nara Ishin no Kai, announced that he would decline to run, saying the time wasn’t right. A poll by the Nara Shimbun last week had current Mayor Gen Nakagawa, 37, with a slight lead over the other six candidates. While Nakagawa had the support of the DPJ in the 2009 mayoral election, when he won 56 percent of the vote, he is running without party support this time. Close behind is former Lower House member Masahiro Morioka, 70, who is backed by the LDP. Municipal assembly member Norihisa Ikeda, 44, is also running, along with Asakawa. Some Nippon Ishin members say they are pulling for Ikeda, who has similar views to theirs on local government reform. With no candidate to challenge Ido, and none for either the Upper House Nara district or the Nara mayoral election, Nippon Ishin’s hopes to expand its Kansai base outside Osaka are fading, regardless of how many seats the party ends up with in the Upper House. Key mayoral races in Kobe and Sakai, Osaka Prefecture, are looming later this year, and Nippon Ishin officials are increasingly worried that continued losses at the local level and a poor showing in the Upper House election will do what Hashimoto’s comments and tensions within the party leadership have not yet done, which is to force large numbers of members in its Osaka core to bolt the party for greener pastures. A growing number of Osaka-based Nippon Ishin members have been quietly sounding out other parties and Hashimoto himself has said the party could be dissolved by the end of the year if it continues to fair poorly.